Having moved in to our new (old) house we were told by neighbours that the lady who had lived there previously had a serious chimney fire which had required the local fire brigade to extinguish it. Although we thought the chimney would have been swept since the incident, we decided it would be safest to get it swept again ourselves. We called up Nik Atkinson of Sweeps and Stoves who came and did a first class job. As well as sweeping the chimney he also cleaned out and checked the back boiler system and tested the draw on the fire. Now we can sit back and enjoy the winter chill in warm, safe comfort. We arranged for Sweeps and Stoves to come and sweep our chimneys. They did a very good job. Nik, who did the work, was polite and friendly, got a lot of soot out of the chimney and didn’t leave a single spot of soot or dirt behind when he had finished. We have no hesitation in recommending them. We were thinking of putting a wood burning stove in and Sweeps and Stoves provided us with lots of useful advice and information. 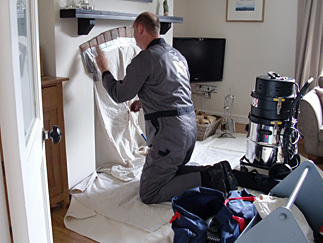 We have now commissioned them to remove our old fireplace, design and build a new chimney breast surround and install a new wood burning stove for us. Nik came recommended to us by a family member and we were very pleased with the service that we got from him. he is clearly a very knowledgeable man in his field with a lot of integrity and commitment to offering a safe and professional service. he gave us lots of free advice regarding replacing the stove that we have currently have. Our house was left as it was found and I have already recommended Sweeps & Stoves to friends.